Since 2006, producers in the Nebraska On-Farm Research Network have been conducting on-farm soybean seeding rate research. Their objective has been to determine if they could maintain yields while reducing seeding rates and thus, curtail rising seed costs. Planting rates of 90,000, 120,000, 150,000, and 180,000 seeds per acre were planted in 13 irrigated soybean fields on 30-inch rows. Prior to this research, many of these producers planted 160,000-180,000 seeds/acre. The low seeding rate of 90,000 was based on UNL research recommending to not replant a hailed soybean stand if at least 90,000 plants/acre remained in the field. Planting dates through the years ranged from late April to early June. 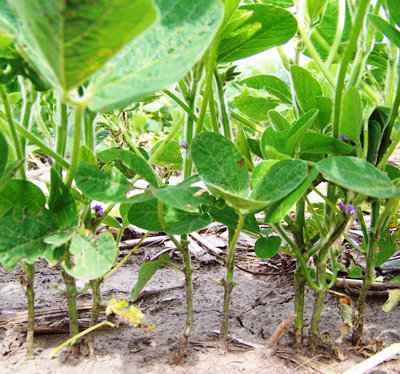 Soybean fields planted in late April or early May were treated with a fungicide, insecticide, or combination seed treatment, but later fields were not treated. The average yield for each seeding rate across locations and repetitions can be viewed in Table 1. These average yields were statistically analyzed by year, but a comprehensive statistical analysis across years has not been conducted. Statistical analysis shows the level of confidence that any yield differences are due to the treatments themselves and not to chance. For example, a 95% confidence level means that there's 95% confidence that the yield differences were due to the treatments themselves and a 5% possibility that the differences are due to chance. In 2006, yields ranged from 65.5 bu/ac at a 90K seeding rate to 67.4 bu/ac at the 180K seeding rate. The yields were found to be statistically significant at the 95% and 99% levels for 90K versus 150K and 180K and for 120K versus 180K. In 2007, no statistical difference was found between yields of 59.4 bu/ac at 90K and 60.2 bu/ac at 180K. In 2008, only the 90K seeding rate was found to be statistically different than the other seeding rates. There was only a 0.4 bu/ac difference between seeding at 120,000 seeds/ac versus 180,000 seeds/ac. In 2010, one producer wanted to add a reduced seeding rate of 60,000 seeds/ac. There were no statistical differences that year with yields ranging from 69.7 bu/ac at 60K to 75.6 at 150K. 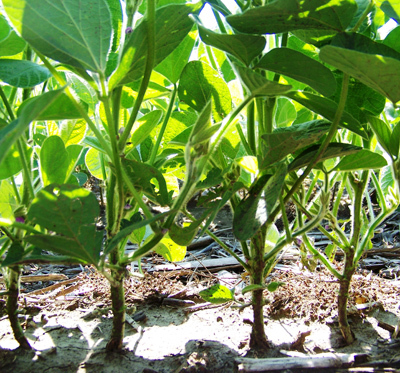 In 2013, a producer was told that populations needed to be increased with newer soybean varieties. He tested this with populations of 140,000 versus 175,000 seeds/ac. Yield results showed a statistical yield advantage to the 140,000 seeding rate with a yield of 79.0 bu/ac versus 77.8 bu/ac at 175,000 seeds/ac. Figure 1a. Lower planted populations of 120,000 compensated for reduced plants by increased branching, flowering, and pod set, regardless of typical variety architecture. Figure 1b. Fields with planted populations of 150,000 were observed having a more erect architecture with reduced branching compared to fields planted at rates of 120,000. Most likely, these minimal yield differences among seeding rates are indicative of soybean's ability to compensate for reduced populations. These results were observed regardless of the presence of a seed treatment. Figure 1 shows increased plant branching at lower populations compared to less branching at higher populations. This was observed in all fields regardless of variety. Also observed in 2008, were two additional nodes/plant at the 90,000 population compared to the 180,000 population. Nodes are important as they produce flowers, pods, and ultimately yield. A dryland field in Nuckolls County also showed interesting results. This field was hailed at the cotyledon stage, so planted populations of 100K, 130K, and 160K became average actual stands of 74,417; 89,417; and 97,917 plants per acre. August rains in 2006 helped deliver yields of 38.6, 40.6, and 42.7 bu/ac, respectively. In 2006, one drilled field in irrigated conditions in Fillmore County yielded 68.4 bu/ac, 66.6 bu/ac, and 67.2 bu/ac for seeding rates of 150,000, 175,000, and 190,000 seeds per acre respectively. Another study in 2006 in a Lancaster County rain-fed field showed a slight but significant yield advantage to drilling soybean at a rate of 152,500 seeds per acre compared to 115,000 seeds per acre. Yield for the higher seeding rate was 56.8 bu/ac compared to 56.0 bu/ac with the lower seeding rate. When using grain drills and reducing soybean populations, variable seed spacing and seed depth within a drilled row can be an issue for soybean emergence. This is why a population increase for drilled beans is often recommended. Based on five years of consistent research results, it's recommended to reduce planting populations from an average of 160,000 seeds/acre to 120,000 seeds/acre in 30-inch rows. This reduction of 40,000 seeds per acre results in a savings of $10.66 to $18.57 per acre based on seed costs of $40-$65 a bag. Producers were able to achieve a 90% stand or greater all years except for one location at 180,000 seeds/ac in 2008 (which was 88% of planted stand). The five years of studies were primarily conducted in silt-loam or silty-clay-loam soils. Reduced seeding rates have not been tested via our on-farm research studies in sandy or high pH soils; thus, these recommendations may not apply to those situations. For more information about on-farm research and how you can test the questions you have in your own fields, please contact any of the authors or visit our Nebraska On-Farm Research website. We would be happy to help you set up the correct research design to answer your question for your farm! You can also learn more from your peers about the value of On-Farm Research them in this YouTube video. Table 1: Nebraska On-Farm Research Network Irrigated Soybean Seeding Rate Results from 2006-2013. Note: Letters of a, b, and c indicate statistical difference at 95%. *Also denotes statistical difference at 99%. **In 2013, letters of a and b indicate statistical difference at 90%.